Where did the last few months go? After returning from my overseas business trip in mid-November I found myself needing a break from staring at computer screens during the evenings (probably related to the fact that I stare at them all day long at work as well). But with a bit of post-Christmas R&R, the push is on to get on and finish the Malaysia posts. After all, the trip there was last April! 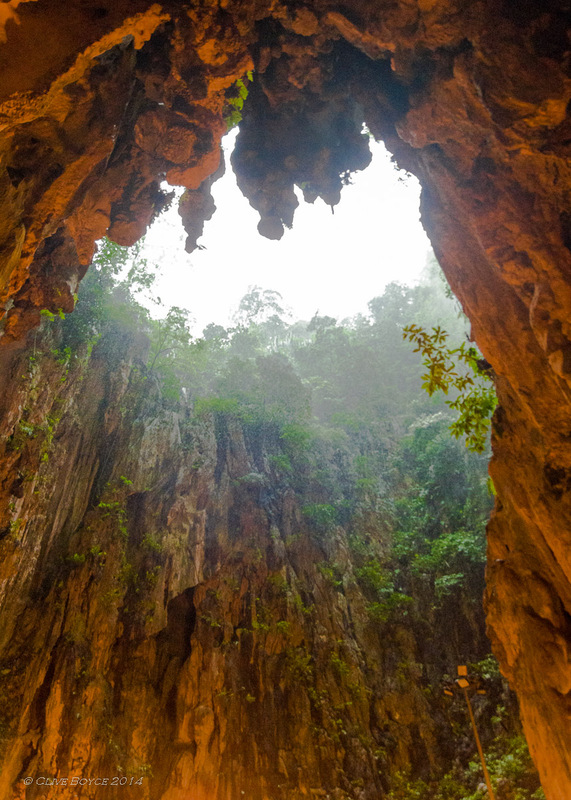 This post covers a day trip from central Kuala Lumpur to Bata Caves, a limestone outcrop that holds a series of caves and cave temples 13 kilometres (8 miles) north of central Kuala Lumpur. It takes its name from the Batu River, which flows past the outcrop. ‘Batu’ in Malay translates to ‘stone’. 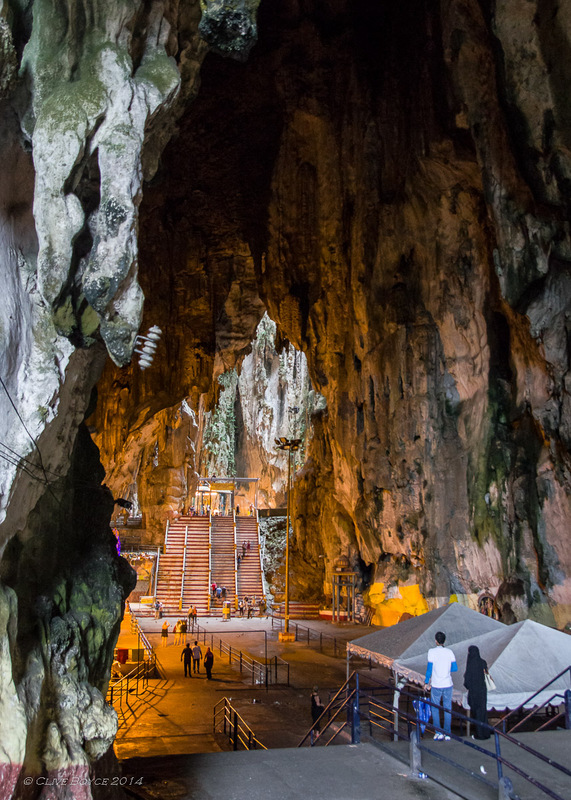 Batu Caves was/is also the name of a nearby village, but today the northern edge of greater Kuala Lumpur has reached the area, so it perhaps better to now describe Batu Caves as an outer suburb. 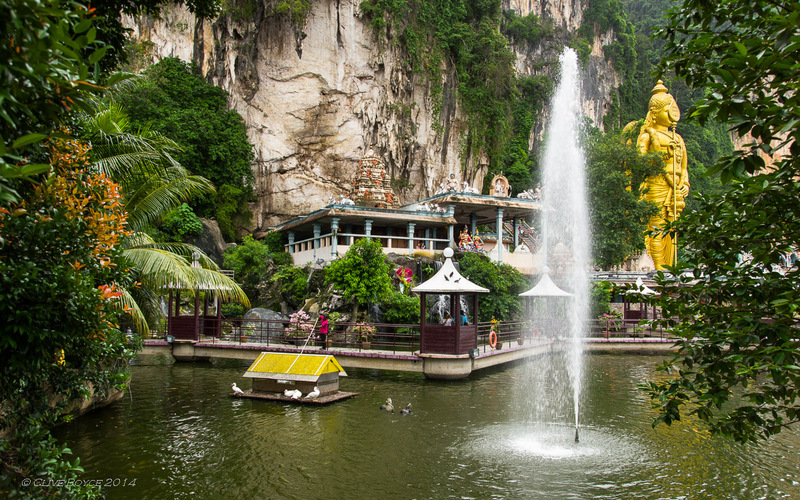 Batu Caves is a popular tourist destination and easily reached by the KTM Commuter train system. 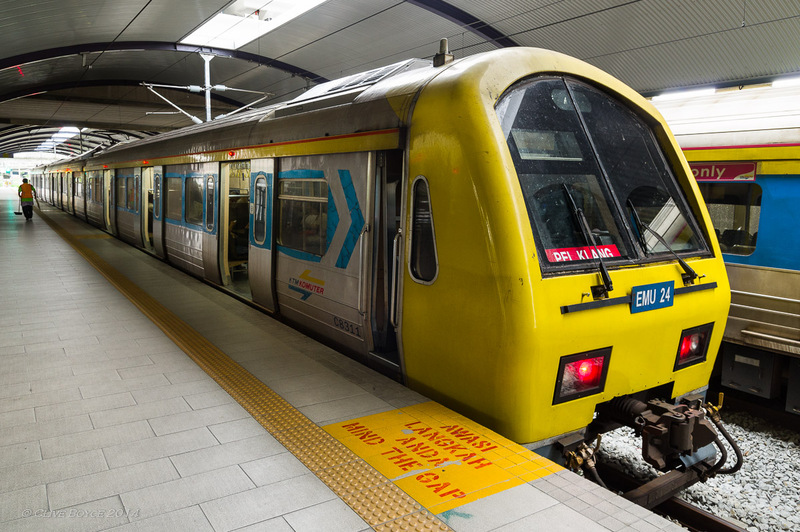 From KL Sentral, take the Bata Caves train out to the far end of the line. KL Sentral station itself is located adjacent to the south western terminal of the mono rail that runs through the centre of Kuala Lumpur. 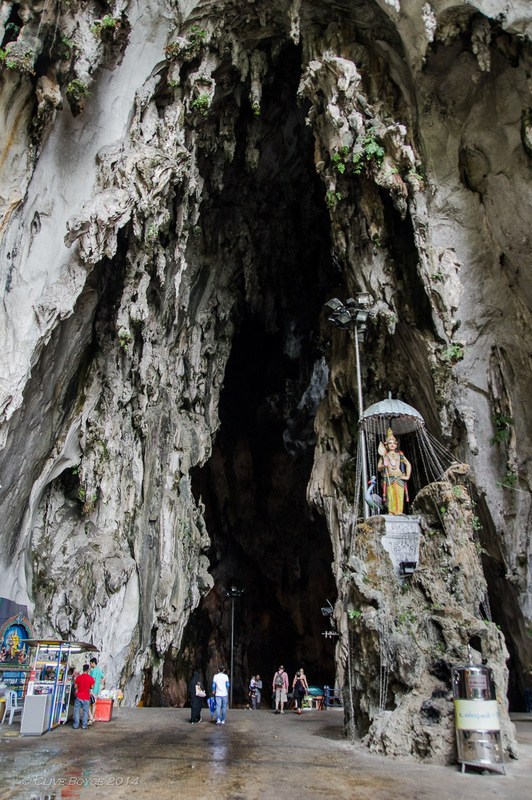 The largest caves within the limestone outcrop form a Hindu temple dedicated to the Lord Murugan, the Tamil God of War, and is one of the most popular Hindu shrines outside of India. 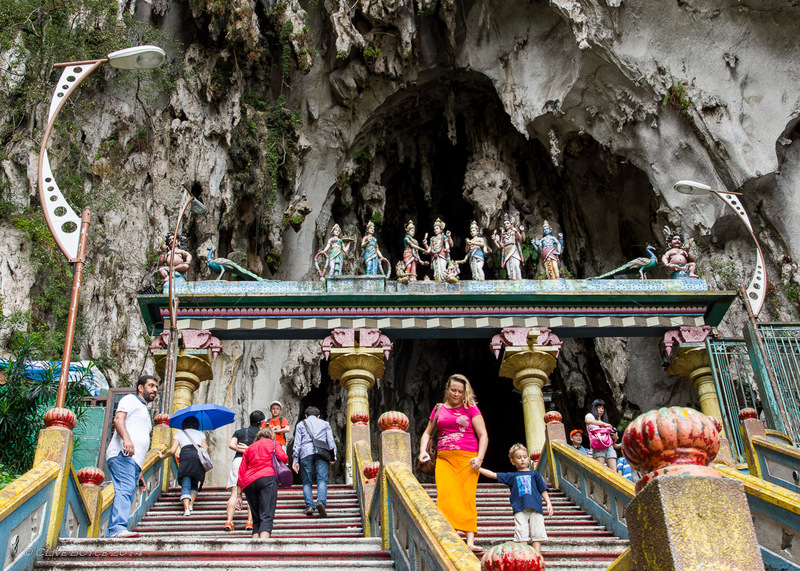 Several hundred thousand worshipers may visit Batu Caves during the Tamil Thaipusam festival (around the full moon of January/February), so you have been warned if you are visiting KL at that time of year. With that intro, onto the photos. 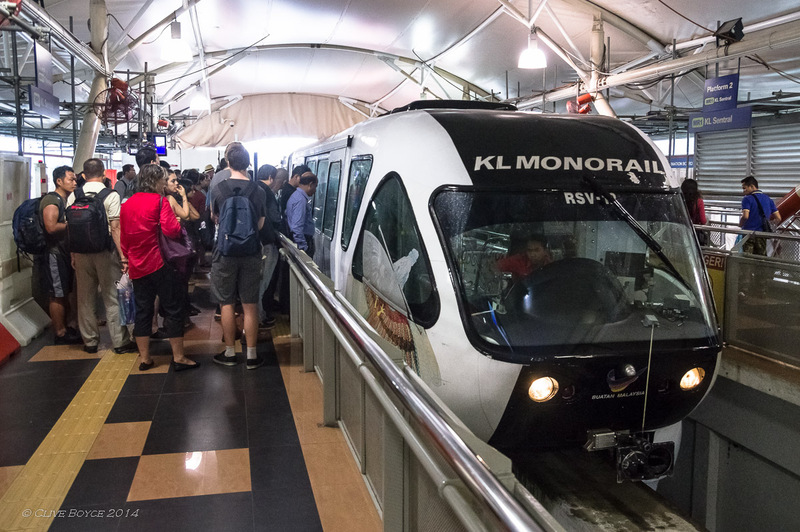 The KL mono rail at the KL Sentral terminal. The mono rail station was undergoing construction works (April 2014), and although I believe there is an easy walking connection through to the KL Sentral train station, we failed to find it and sent a good few minutes aimlessly roaming about the streets below the mono rail station. Que sera sera. Our transport out to the Batu Caves terminal of the KTM Commuter line was on this electric train. While the front end design looks rather British, it is built by the Japanese firm Hitachi. 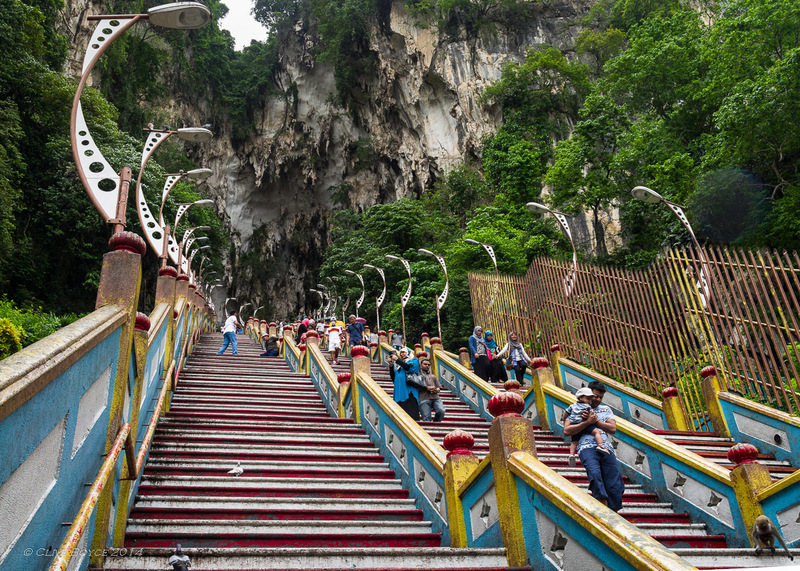 The first of the Batu Caves temples is immediately beyond the exit from the station. 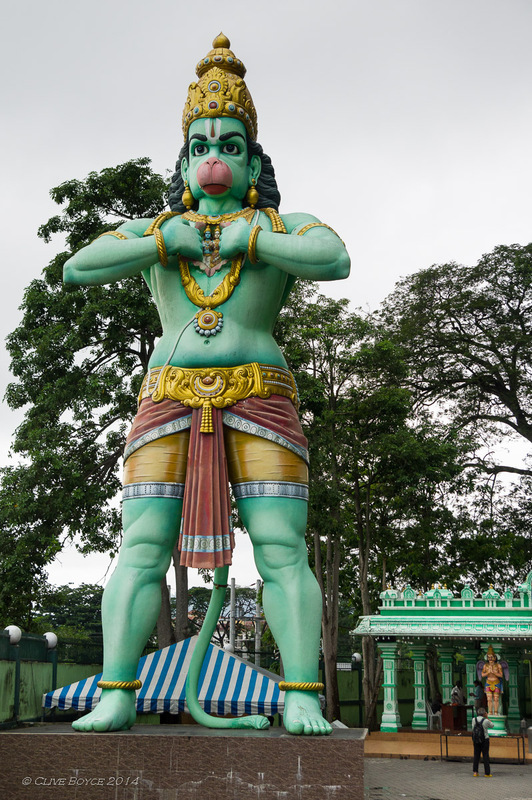 where one is greeted by a 50 foot high green monkey presenting Hanuman, a Hindi god. 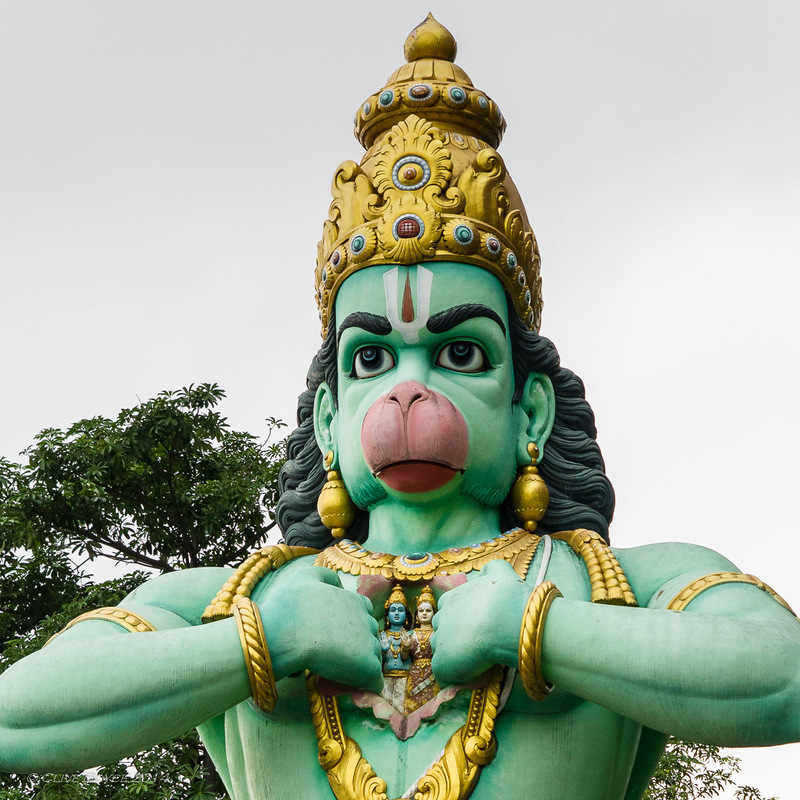 Until prepping photos for this post, I hadn’t noticed that the statue depicts Hanuman opening his chest to reveal two figurines. It’s taken a bit of googling, but the two figurines represent another Hindu god, Rama, and his wife Sita,and represents Hanuman’s devotion to Rama. A short walk takes visitors past a picturesque lake and provides a first glimpse of Lord Murugan. 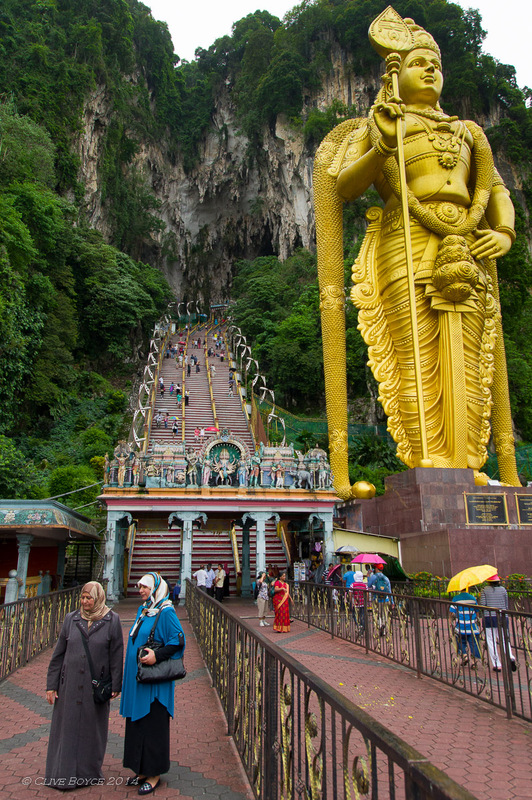 At 43 metres high, the statue of Lord Murugan is hard to miss. It is the second tallest statue of a Hindi deity in the world, and used 250 tons of steel bar, 1,550 cubic metres of concrete and 300 liters of gold paint in its construction. 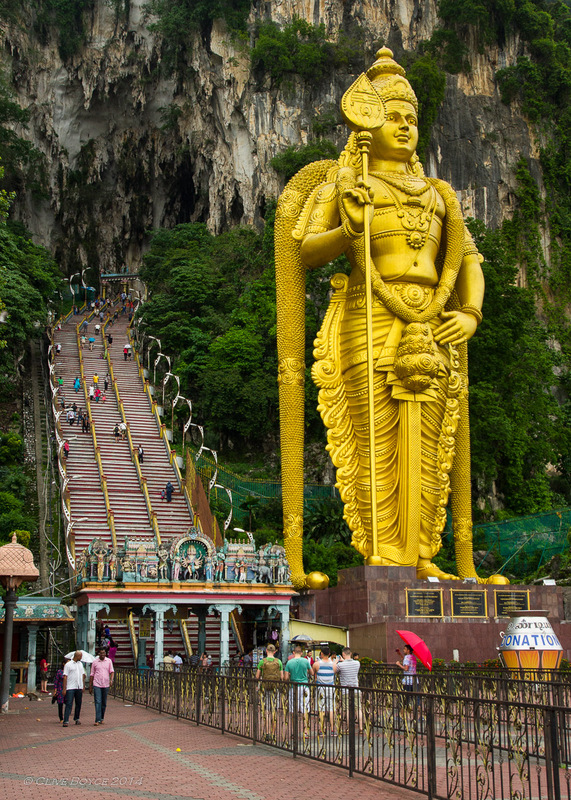 By way of reference to another well known statue, Batu Caves’ Lord Murugan is only three metres shorter than the Statue of Liberty in New York (not counting the pedestal). The steps heading up to the Temple Cave entrance. As is common at many public events these days, a bag inspector patrols the entrance area. 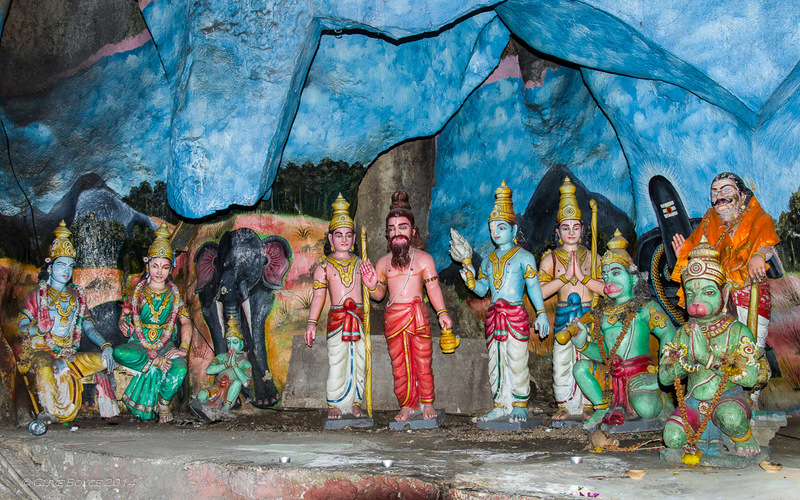 Shrine to one side of the Temple Cave steps. Up we go, 272 steps in total. Huff, puff, nearly there! A benefit of carrying fancy camera gear about is that you can stop for a ‘photo opportunity’ and look genuine while doing so. The imposing opening to the Temple Cave. The far side of the Temple cave opens onto an area where the cave roof has completely collapsed, revealing the jungle atop the outcrop that holds the cave system. The weather also chose this moment to start pouring with rain. 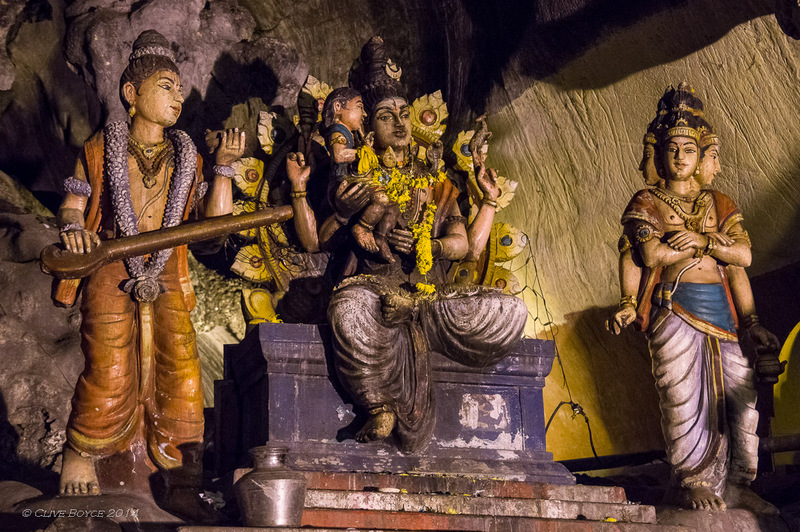 Inside the cave are numerous Hindu religious scenes and several temples. After visiting Temple Cave, it was back down the steps which were now awash with water after the rain shower. The descent was a little treacherous as a result. 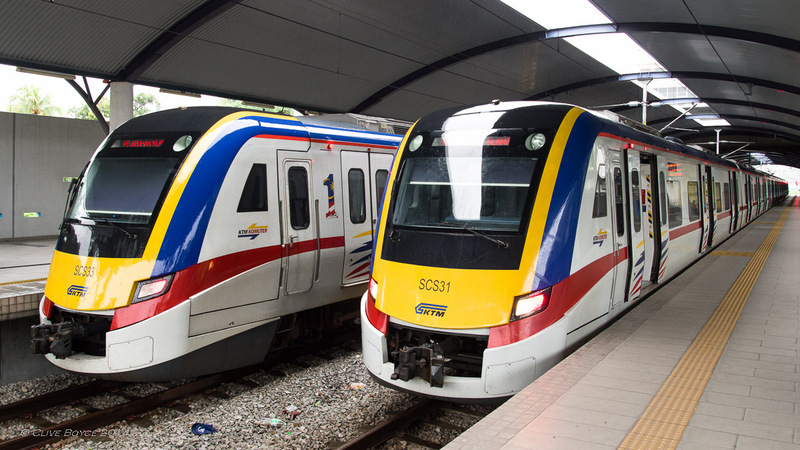 And to return to KL Sentral, it was back to the Batu Caves station where a couple of KL’s newer commuter trains were waiting for us. 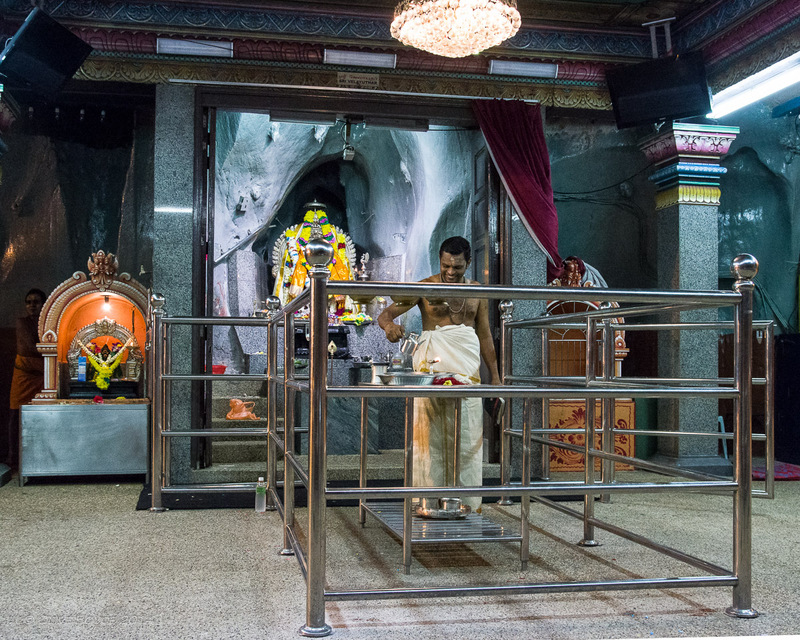 The Temple Cave was reasonably dark, not helped by the heavy cloud and rain outside. 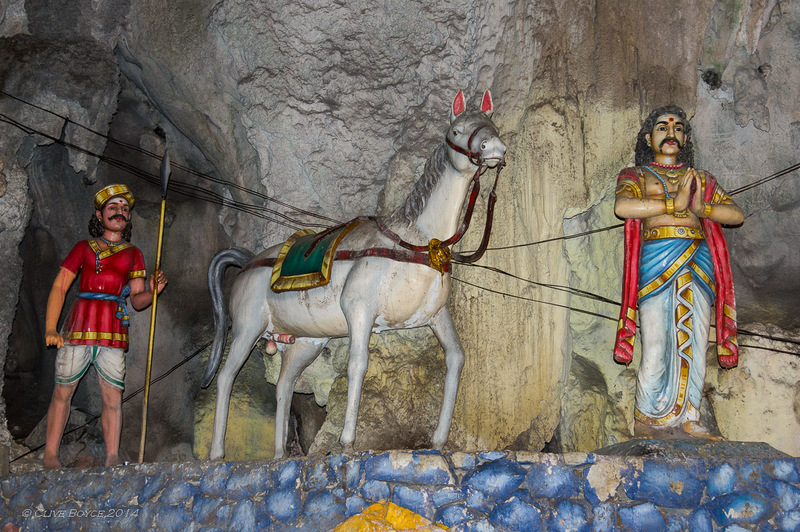 I used the on-camera flash for some of the small statues within the cave, but otherwise relied on natural lighting. Ended up using ISO 3200 and ISO 6400 sensitivity settings for some of the interior, and once again was rather impressed with the K-3’s low noise levels. White balance on some of the natural lighting images was a real nightmare (combining elements of daylight and all sorts of artificial lighting sources) and the resulting unnatural colour tints consigned a number to the cutting room floor. 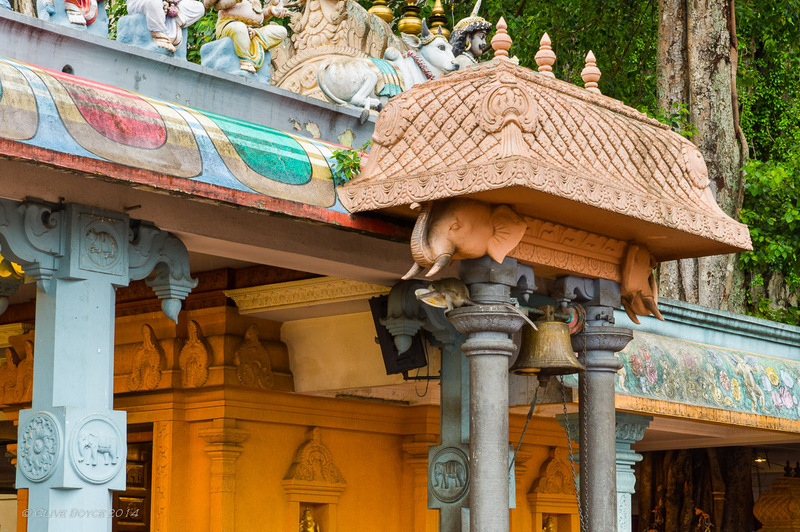 It’s an easy trip by train out to the Batu Caves from the city centre, so no need to take an organised tour to get there. I’d allow a half day for the trip, more if you want to explore the Dark Cave (see below). Entrance to the Temple Cave is free. 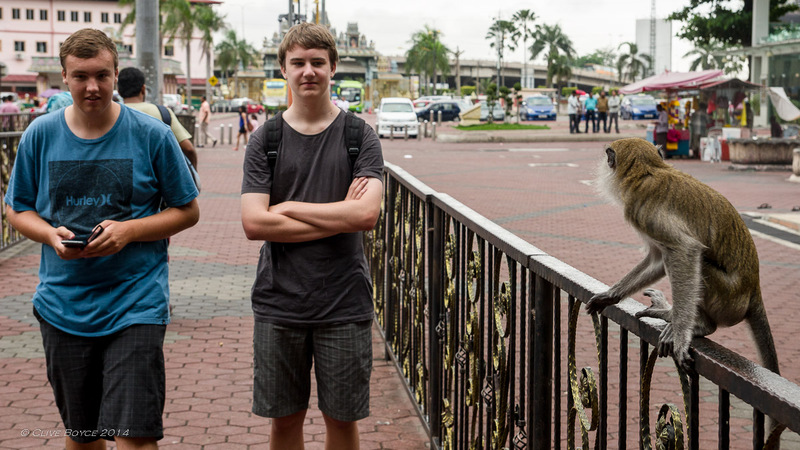 The macaque monkeys around the temples and the base of the stairs can be aggressive, so keep food and handheld items well out of their sight. There is also a another cave, the Dark Cave, to one side of the Temple Cave. It is a two kilometre network of relatively untouched caverns where apparently stalactites and stalagmites have created formations such as cave curtains, flow stones, cave pearls and scallops. We didn’t go into this cave (fees apply), but if ever in KL again I would be tempted to go take a look. 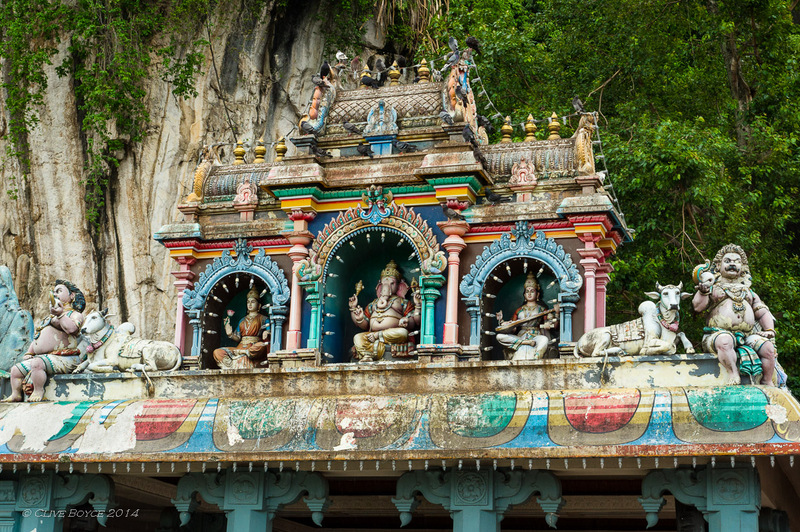 This entry was posted in Malaysia, Overseas Travel Locations, Places to Visit and tagged Batu Caves, Hindu Temple, Kuala Lumpur, Malaysia, Photography, places to visit on December 22, 2014 by aussiesouthlander.